A friendly, warm welcome accompanied by an introduction to the simulator and the world of an Airline Pilot. Family and friends welcome - we a small aeroplane cabin area with seats, so they see what's happening and be part of your flight. This is your flight session, so we'll tailor it to your requirements, for example some people like to be given technical information about the Boeing 737, others just want the experience of hands on flying. You can spend your time practicing landings or run the session as a complete gate to gate flight. Bespoke flights either a 60, 90 or 120 and 240 minutes - long haul in real time also available. Choose the airport(s) you fly from, anywhere in Europe and the world! Select you're own weather to fly in from sunsets to thunderstorms and snow. Please click to book your flight here. My name is Matt Briggs, and I've been fascinated about the idea of flying since childhood. I have been lucky enough to have been taught and inspired by two of the worlds most amazing aviators. It is with that privilege in mind that I aspire to share the best in good airmanship. I love aviation for so many reason, and with help of friends & family, the Jetsim Centre has been established to share that passion with people of all ages, and from different backgrounds. Working with the Rich Goodwin Airshows team in the UAE. My flying started with a private pilots licence at Exeter Airport in 1992, and then in 2004, I resigned from a marketing career to study at Oxford Aviation, two years later qualifying as a commercial airline pilot. After that progressing an ATR 42/72 type rating and then a single engine Flying Instructor - it was teaching others that showed me a whole new level of airmanship. So, if flying the heavy metal is on your bucket list of things to do, and you're interested in booking a flight, or maybe it's for a present, perhaps someone you know needs help with fear of flying - please do get in touch. A 220 degree projection screen ensures a fully immersive experience. The simulator replicates the real world aircraft, based on the Boeing 737NG 800 - a real Pilots flying machine. It has fully function FMC's loaded with a global database of airports, nav aids etc. We can enter flight planning, performance and fuel data to reproduce a complete airline flight from gate to gate. The autopilot and all instruments, switches and gauges operate systems onboard. 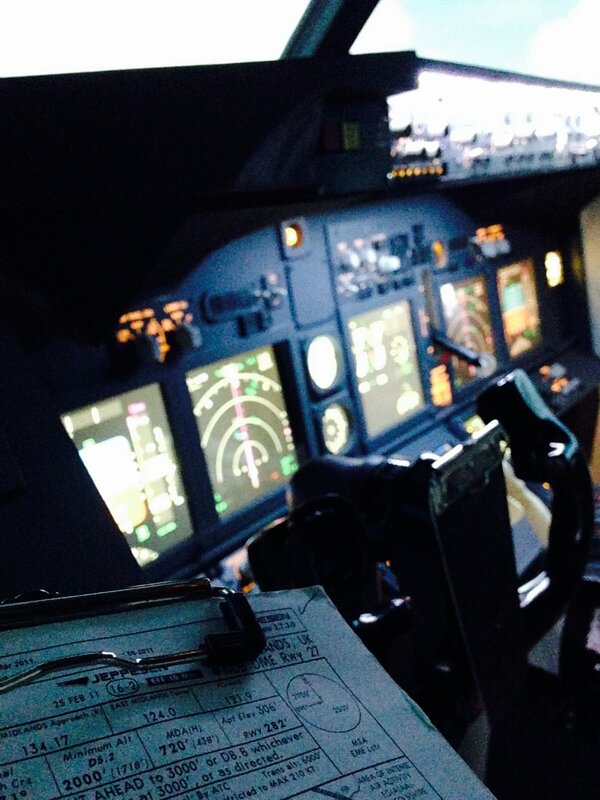 Checklists can be used for start procedures, practice failures and emergency scenarios. The simulation can also use real time weather conditions or be programmed from the METAR and TAFF aviation forecasts, we have some pre-set scenarios too, such as thunderstorms, low cloud to test your instrument scan, sunshine and snow etc. If you're a commercial pilot looking to prepare for a sim check, LPC etc, then I'd be delighted to help. Please get in touch to chat through your requirements so we can create a bespoke session(s). Generic checklists and QRH are provided, but do also bring your own if preferred. Please get in touch, e-mail me with any questions. Thank you, I'll be in touch as soon as possible.